Johnson’s Northern Italy, Lombardy, Venice, Sardinia, Tuscany, Parma, Modena, Lucca, and the States of the Church. / Johnson’s Southern Italy, Kingdom of Naples, I. Sardinia & Malta. 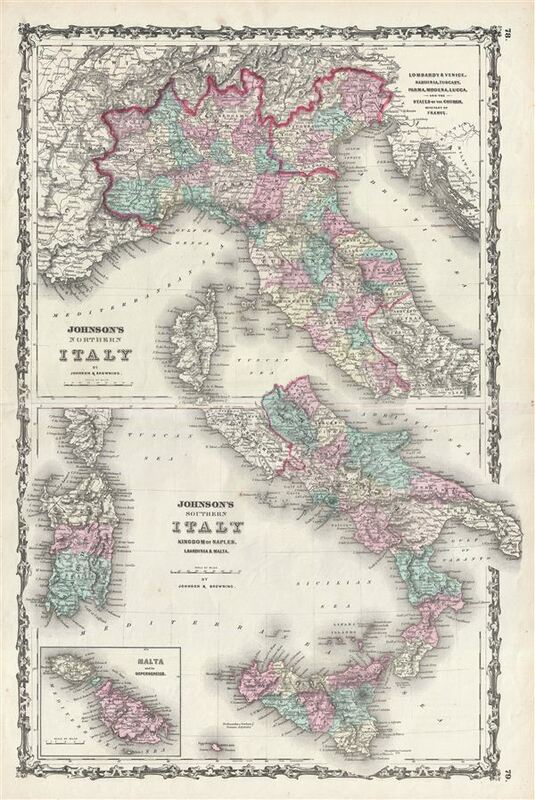 A marvelous 1861 map of Italy by the American cartographic publisher A. J. Johnson. Depicts the Italian peninsula in the midst of its struggle for national solidarity. The map is divided into two sections – northern Italy and southern Italy – reflecting the sources of this map in Colton's 1855 separate maps of Italy. As this map went to presses Giuseppe Garibaldi and his Red Shirts led the drive for Italian unification. On March 17, 1861, the Sardinian government led by the Count of Cavour finally declared a united Italian kingdom. However, Johnson's map reflects the tenuous stated of the new Kingdom with both the States of the Church and the Duchy of Venice segregated from the bulk of Italy. Italy would not be fully united until the Franco-Prussia War forced France to abandon its support of the Papal States in 1870. Lower left hand quadrant features an inset map of Malta. Published by A. J. Johnson and Browning as plate numbers 78-79 in the 1861 edition of Johnson's New Illustrated Family Atlas. This is the last edition of the Johnson Atlas to bear the 'Johnson and Browning' imprint. Subsequent editions reflect Ward's 1862 acquisition Ross C. Browning's shares in the firm. Johnson, A. J., Johnson’s New Illustrated Family Atlas, with descriptions, Geographical, Statistical, and Historical. , 1861. Rumsey 2905.047 (1860 edition). Phillips (Atlases) 6140.